Posted	 April 10, 2019 by	Siri Singh Sahib Ji & filed under 10-Guru Gobind Singh, Gurpurbs. This article was originally published in Beads of Truth in June 1974. 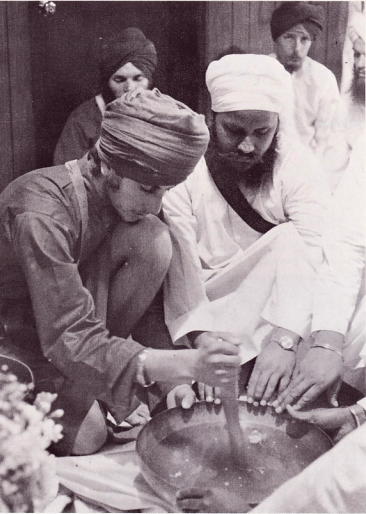 It is based on an address delivered by Siri Singh Sahib, Yogi Bhajan on April 13, 1974. Baisakhi Day is celebrated as the Anniversary of the day when Guru Gobind Singh first initiated five of his faithful disciples into the Khalsa (the Brotherhood of the Pure Ones.) This year, another historical event took place in Guru Ram Das Ashram in Los Angeles, when for the first time in history, an American Sikh participated in administering the Amrit to the nearly 100 Sikhs who had come to receive it. Actually, it was the purpose to liberate the man from the clutches of his ego, unto the Universal Identity. For this, man has inspired himself through the ages to get into the realism of his life. Two thousand years ago, the sentence was repeated in the Bible, “In the beginning was the Word, the Word was with God and the Word was God.” Today the Word of God is presiding over this congregation, and we are all sitting as a part of this holy congregation. The practical experiment to exalt the Word of God in a practical sense failed throughout the times. It was impossible because personalities had to play the part; they had to carry the Word. But this time came to its end, and finally after the time of Guru Nanak, Guru Gobind Singh installed Siri Guru Granth Sahib as the Guru for those who followed the path of Infinity and the path of righteousness. Is it a coincidence that the Passover, Easter and Baisakhi all come at almost the same time? Moses led his people to freedom; the slaves became free; he exalted them to the normal consciousness and they remember the Passover, when the hard times, the dark time, passed them by. Easter marks the resurrection of Jesus Christ, when he could come in the pure light and exchange the Word thereafter for 40 days with his disciples. Guru became very happy, saying, “You are one, at least. You have kept the respect of the whole congregation.” He caught him by the neck and took him into the tent. God knows what happened, but when he came out, the sword was dripping with blood. It was very horrible. It appeared that an innocent man was just killed because of his faith. What had the Guru done to him? Imagine that scene! He said, “I need another head!” “God, he’s really crazy! You know, no sense is there. What is he doing?” Nevertheless, a second man got up. The Guru repeated this drama five times and out of that entire congregation of the faithful, the devoted, only five came forward. When the last man went in, it took a very long time, so everybody started whispering, “What is happening now? What is he going to say? If he’s going to ask for another head, who’s going to come forward? ?” So they were all exchanging their doubts . On this day, Guru prepared the Amrit and he baptized his Five Beloved Ones, and strangely enough, after he kissed them, hugged them and honored them, making them the Singhs (Singh is a person who masters his animal nature), then Guru bowed before them and begged of them that now they should prepare the Amrit and initiate him! So Baisakhi is a very beautiful day when Gobind Rai became Gobind Singh. You perhaps do not know that his name was Gobind Rai before that Baisakhi — that fortunate day when he became Gobind Singh. Thus, on that day, he even changed himself. Sometimes I look around at all that we are doing–with all our devotion, with all our doubts, with all our sacrifice, with all our advances and retreats. It is a very joyful time; we should think over it. There is a book, a very important religious work, which is known as “Bawash Puran.” It was written 2,000 years ago and it prophesied all the human events which have to happen in every part of the world. It does say that in the Kali Yuga, the Age of the Machine, the Age of Darkness, the Age of Steel, there will be a man of God with the name of Guru Nanak. His followers will fight for righteousness and finally, in the Northern tract of India (then known as Bharat), they shall establish themselves a rule of righteousness, but it shall not last more than 35 years. Then they will lose it by the treachery of the people among them, and they will pass through a lot of turmoil and finally they will scatter and spread themselves all over the world. Then from the Western Hemisphere they shall come and rescue the land of their Gurus. That is one part of it. It further goes on to say that they will be so righteous, they will be so helpful and graceful that they will turn the whole world onto the path of righteousness. All of this was predicted to occur 1500 years after the time of the Messenger of God, and then they will rule this Earth for three thousand five hundred years. Look at what we have done. In this age, the dead did rise in Resurrection to give the message of Truth. And we rose from drugs to the sainthood, to the whiteness of the 8th ray of human life, to spread the message of Truth. Where is the difference? In this very time the slaves were guided, inspired and encouraged and Christ made a path through the Red Sea for them to cross. Today, by our faith and out of our love and out of our devotion, we have crossed the darkness of the time. Even the greatest hazards have given way to us and we have survived. On this earth, the Guruship of the Word of God has to be established in practical ways. That is what Sikh Dharma is about. We don’t bow to the man behind, but we do bow to the consciousness of those who merged themselves into God. Sometimes you do not understand how “Siri Guru Granth” is Guru. Let me explain to you. There are five words: Gur, Guru, Sat Guru, Siri Guru, Wahe Guru. Gur means formula of applied consciousness; Guru means the experiment of the formula of applied consciousness; Sat Guru means the experience of the Truth of the formula of the applied consciousness; Siri Guru means the universality in experience of the Truth of the formula of the applied consciousness; Wahe Guru means the ecstasy of the Truth of the formula of the applied consciousness. So when we read the Word of the Guru, or we understand the essence in meaning of it, it gives us the same prana–the prana through which we speak and vibrate. Our lips become the lips of Guru Nanak, our language becomes the language of Guru Nanak, our personality becomes the personality of Guru Nanak, and almost at that moment we become Nanak. Because he spoke the same language we are speaking, he uttered the same words we are uttering. When language becomes one, oneness is established. That is the power of the Word known to man through the ages. But it was difficult to establish that, and so we are grateful to Guru Gobind Singh, that after becoming Gobind Singh from Gobind Rai, he could give us the same virtuous path. 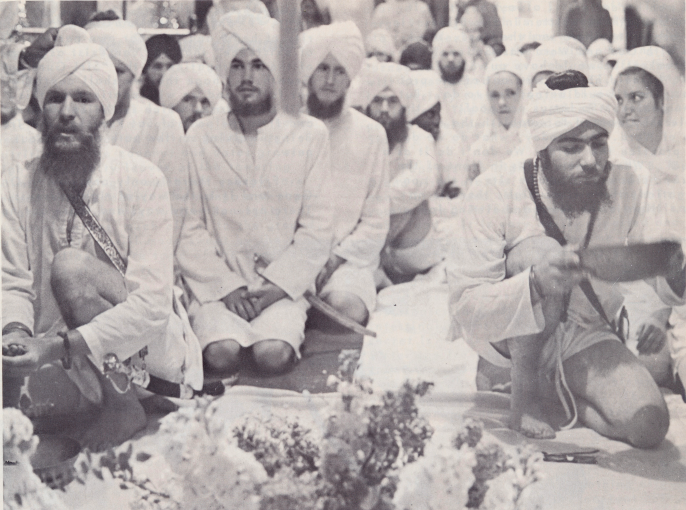 There are twelve Gurus among the Sikhs, not ten. Sometimes we misunderstand. “In the beginning there was the Word…”, so the Guru of Nanak was the Word, and he himself says, “Shabd (word) was what I worshipped and then I found God.” The Guru of Nanak was the Word, then comes Nanak. Then this takes us up to eleven Gurus and then Guru Gobind Singh bowed to the Word again, “Siri Guru Granth.” The total comes to twelve. The twelve Gurus completed the complete cycle of the oneness of the man, and man hereafter. I always say that if John would have written in the Bible, “In the beginning there was the Word, Word was with God and Word was God…” and in brackets he would have put “Sa-Ta-Na-Ma”, I would have gotten out of the problem. There would be nothing to do. But John goofed. So let us not goof. In the Bible they wanted to establish the supremacy of Word. And today, what do we do? We practice the Word. We don’t do it as a ritual. 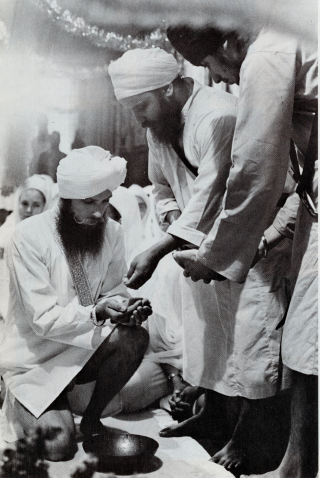 When a man walks in front of the Guru, he bows. When he sits in the congregation, there is no high, there is no low. High is the Word and sitting low are those who look to the Word as exalted Self. And it is practical. If John were here, he would have loved it. They might have crucified him today, killed him for saying so, but his soul would have been very, very free and very exalted. At least for humanity on this earth, the rulership, the ecstasy of consciousness of the Word has been established. I hope that we shall continue in our faith, and we will continue on this path of Dharma, which is the Sat Dharma, and it is the path of Sat Purusha, the True Being, walking on the path of righteousness.